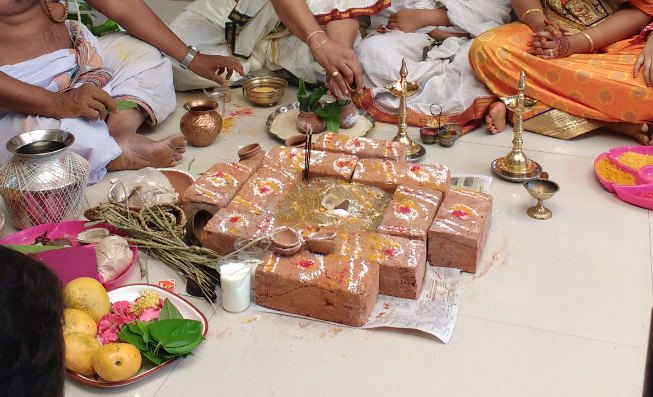 Most people who love to celebrate important ceremonies in a traditional way, perform even this yajnopavita or Upanayanam ceremony also in a grand manner inviting many guests and devoting much time to each and every moment of it just like a marriage. A muhurat or an auspicious time is fixed with the advice of pundits to celebrate it at some special time and date according to the horoscope of the person for whom it is celebrated. The preparations also need to be started on an auspicious day so that everything gets arranged by the time of the actual commencement of the ceremony without any hindrances. 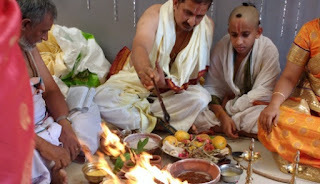 At an auspicious time, the child or the person is declared in front of some close relatives and other neighbors that he is going to be adorned with the sacred thread after giving him an oil bath, applying a tika on his forehead and offering him Aarti in the midst of some devotional songs sung by young girls and married women. Thereafter, invitations are sent to all their relatives and other friends, etc. requesting them to attend the ceremony on that actual date of the function and to bless the child with good wishes. Most people perform a Udaka Shanti ritual before starting this Upanayanam ceremony to obtain the blessings of God for making it an auspicious and a successful celebration without any hindrances. On the Upanayanam Day, the parents and the child take the oil baths and wear the pure and auspicious clothes and get ready by the time the pundit arrives there. 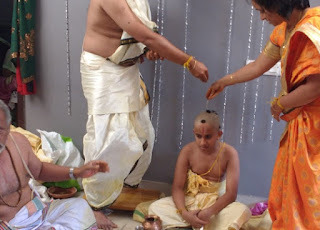 As I already mentioned in this post, on an auspicious day, the parents announce their decision of performing the Upanayanam to their son in front of some close family members by dressing him like a groom ready for the auspicious event offering some Aarti to him and performing some puja. Thereafter, a puja is done to the sacred thread also at your convenience. You may get it done during the actual Upanayanam ceremony also as per your purohit's advice. Some people may perform Cow Puja also and offer daanam (giving away some gifts) to Brahmins. Udakashanti: This ritual can be performed on the previous day itself if you are to start the Upanayanam ceremony early in the morning. This is the purification of the water that is to be used for puja and other purposes of purifying the home and surroundings. It is already discussed elaborately in one of the previous articles. Kalash Sthaapana and Kalash Puja: This is the ritual of the invocation and worship of Lord Ganesha, and the 5 elements of the universe known as Prithvi, Ap, Tejas, Vayu, Akash (respectively referring to Earth, Water, Agni signifying light, Vayu signifying air, and Akash is the sky). The Kalasha as a whole represents also the God Vishnu/ Shiva and Goddess Lakshmi/ Gauri. It is the small round vessel full of water (the shape of the vessel is like a pot) which is placed at the worship place decorated by applying turmeric paste around it and some red tilak spots, a flower garland, and some mango leaves inside it and topped with a coconut wearing a turban on its head as shown in the below images. This Kalasha is worshiped with Vedic hymns and prayers invocating God. The water in the big pot is already purified with the Udaka Shaanti water and kept there for use as and when required while performing the rituals. After this ritual is over, they have kept aside and only the water required for each proceeding ritual is kept at the pooja sthal. Now, the actual ceremony of Upanayanam begins with Puja and Yajna. 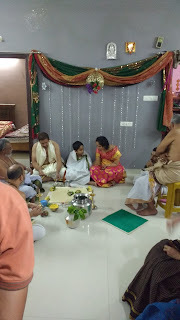 The yajna sthal is set arranged and the couple brings the pooja material and the sacred threads in a wide plate to sit in the ceremony along with their child. First, the worship is done to Lord Ganesha and other Gods. A red or yellow colored thread known as Raksha is tied to the wrists (right hand of males and to left hand only of females) of the persons performing the ritual. The pundit ties it to the adult male. Then he is given other threads to be tied to his wife and to his son. All the three do the puja lighting the diyas, worshipping with flowers, showing the lighted incense sticks and offering the naivedyam. The fire is ignited by placing some sandal sticks on the sand inside those arranged bricks there. Worship of Agni and the Panchabhootas (the five elements of nature) and God Vishnu are done. Ghee and Navadhanya get offered during that yajna ritual amidst chanting of Vedic hymns by the pundit. 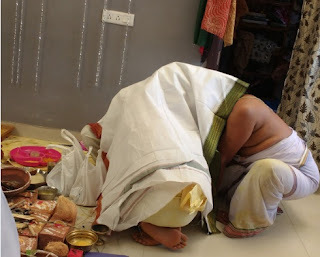 After the yajna is over, a mimic of Naam Karan, Annapraashan, and playing in mother's lap are enacted to relive the moments of the child's childhood days. Both the child and the parents enjoy this occasion. Naam Karan is the naming ceremony of the child done after the birth of a child which is normally done on the 12th Day or 21st Day. Some do it at the age of 3 months or 6 months or even on the First Birth Day. Anna Prashan is the ceremony of feeding solid food to the baby for the first time. It is usually celebrated at the age of above 6 months when the teeth begin to appear in the baby's mouth. During even months for Boys and Odd months for Girls. Usually, mother's brother known as Mama does the annapraashan. Playing on mother's lap remembering the childhood days is a very happy event. Normally, this happens during the child's babyhood days to his pre-school period. The above rituals are a reminder of his childhood days before he is entrusted with the yajnopavita. The parents and the child spend some nice time together by remembering those happy celebrations through this process of Upanayanam ceremony. The boy is now taken to the barber waiting outside the house or on the balcony to get his head shaven leaving 5 locks of hair, four around the scalp and one at the top center. It is a ritual which is regarded as the prerequisite for a child to receive his education. It signifies the simplicity and purity of the boy who has decided to obtain the education with full concentration leaving all other enjoyments and distractions of life behind. The sikha signifies his determination. After getting the tonsure done, the child takes a complete bath and sits again with his parents at the yajnasthal to perform the homam. Ghee is offered to Gods in the sacred fire while Vedic hymns are chanted by the pundit for 10 minutes or so. After that, an oath-taking is performed to treat the sacred thread as sacred in all respects with great respect and puja is performed to the sacred thread placed in the puja plate in front of the fireplace. Thereafter, the thread is worn to the child's body by the parents keeping one end on his left shoulder and the other hanging across his chest towards right-side from under the right shoulder while the priest chants the mantras. 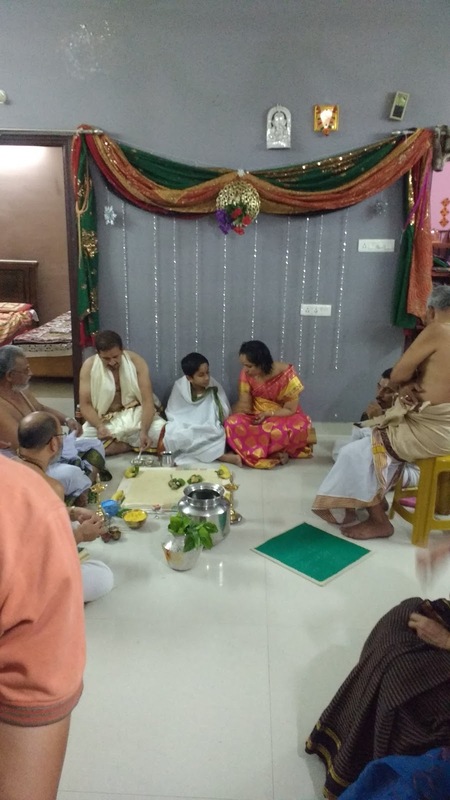 The child receives the blessings of his parents who drop over his head the puja flowers and rice known as akshatha wishing for his supreme knowledge, health, and prosperity during his life. Other relatives and elders also bless him after that starting with the Mama, then grandfather and others. This is the ritual of the child taking meals along with at least two other unmarried and sacred-thread wearing youths and three married (having their husband presently) women. At this ceremony, it is the first time for the eight-year-old child eating on his own. Till then, he has been fed by his mother and doesn't know the proper way of eating according to the scriptures. Now, is the time for him to learn how to eat by seeing the other sacred thread wearing lads who eat along with him. He watches them and does the actions according to them while eating. After the meals taking ceremony is over, the co-eaters are gifted with some cloth, fruit, and money as a respect to them by the child and they bless him. Now, the Gayatri Mantram or sloka is to be imparted to the child. First, the child is entrusted with the Krishnajinam. A small piece of the black deerskin is tied to his sacred thread by the priest. and then they perform puja to the Gods for some minutes. Thereafter, the priest and the child along with his father sit in a round group covered with a cloth over them. The Gayatri mantra is treated as an auspicious possession and it is uttered by the priest into the father's ear who then utters it in the child's ear, each word of it separately so that the child can properly understand it. When it is fully imparted, they remove the cloth and come again to the puja sthal. The priest elaborately teaches the child how to perform the daily rituals relating to the Gayatri Japa and Sandhyavandanam and makes the child understand it properly. He is advised to perform it daily three times without failure at the prescribed timings. The father is advised to oversee the child and help him in doing it properly. 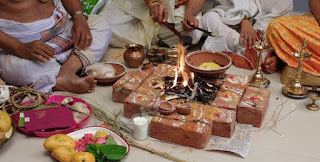 Then the child performs the homam to Agni as per instructions of the priest who chants the prayers and guides the child to place the sandalwood pieces to ignite the fire and offer the ghee, etc to the sacred fire. After these rituals, the child is instructed to seek alms from his elders. The first giver of alms will be his own mother. He should first bow to his mother and seek alms from her. Then he will take her permission to seek the alms from other relatives starting from Mama, maternal Grandfather, maternal grandmother, then the paternal grandfather, and in that sequence. Now, the child sits with the priest again without the company of the parents. All guests get engaged in the Dinner while these two sit there. The priest who is the Guru at this stage imparts the child with some fundamental basic principles that are to be practiced in his daily life as a Brahmachari and the process of obtaining spiritual knowledge as per lessons from the Vedic Texts. Through this, the child develops an idea of what is religion and philosophy and what is the essence and importance or objective of all this human life on earth. With this foundation, he can go on the search for a deep knowledge of Vedas, Upanishads, and Spirituality in the years to come. There is a full description of all the ceremonies performed by Brahmins and Vaishnava community people at this link which runs into many pages (Page no.267 to 322).